Uniting the world, one hug at a time. In a world where you can play violent video games and pretty much do whatever you want, there are also games that deem violence as being unnecessary and focus on family fun instead. Then there are games where the hugs are free and iHUGU is one such game. From developer Kool2Play, iHUGU is a retro-themed arcade game where the rules are simple and the gameplay is even simpler. Upon booting up the game, players are thrown into a game world where they must either swipe right or swipe left like you would when navigating most apps on a mobile device. Except when you do it in iHUGU, you swipe right to hug someone and swipe left to move on to the next one. You see, in this game that is “is designed to promote peace and positivity,” you must traverse cities and give everyone a free hug, but everyone only gets one. Hug the same person twice in the same world and its game over. Should you avoid those you’ve previously hugged, you will be able to move on to the next person and the next person and the person after that, until you complete your current level. Upon level completion, before being thrown straight into the next day which will take place in a randomly chosen city such as Moscow, Hugland or New York, a mini-game will take place. In some you are only required to run left or right, in a bid to collect clovers and some of those mini-games will have you participate in a hug battle and having to mash the A button should you wish to win. Getting as many clovers as possible is something you will want to do, since every time you have 100 clovers, you can access the games slot machine and unlock a new playable character, earn more clovers, get a star-shaped continue or get another life preserver item. The life rings are handy for when you’re on the likes of Day 5 and you have encountered so many different life forms that you can no longer remember if you should swipe left or swipe right, as the life preserver will have your character perform the right action for you. Should you take too long to use the life preserver or perform an action yourself, the meter bar at the top of the screen will empty and it’s game over. As for the quickest way to earn the clovers, while you can get a few during the mini-games, you’re better off sticking to the daily quests. Each character has a total of three that they can complete, but they can only be done one at a time and could require you to reach a certain number of days, use the life ring a couple of times or hug a very specific person. Only it’s not just people you could be required to hug since iHUGU features a whole array of people, animals, mutations and aliens and they all deserve a kind embrace. There’s no discrimination here! Furthermore, the characters you can encounter in iHUGU are all playable, but you are required to unlock each and every one of them. It’s a long process, but with the game’s character editor, you will be able to cycle through the heads and bodies of characters you have unlocked already and create your ideal persona. I must warn you though, there are more than 20,000 possible combinations. Reverting back to the daily quests though, when one character has completed their three quests, more are available, but a certain amount of time will need to elapse before the next batch is available and it goes on and on, with each next batch of quests taking even longer to pop up. However, in the event its lovely-dovey soundtrack and single player experience of trying to get as high a score as possible before succumbing to a game over, the Switch release of iHUGU does have one exclusive feature I have yet to bring up and that’s multiplayer. Whether you have a Pro Controller each, or a single Joy-Con, two players can come together and embark on a mission to save the world, one hug at a time. In true multiplayer fashion though, it is a competition, as the first player to hug the same person twice in the same day, loses. It’s a bit contradictory to have a loser in a game that in essence promotes goodwill to everyone in sight, especially when the game has a theme song all about love, but when in Rome I guess and just in case you’re not a fan of playing with a controller, there is some good news to be had here. Touch-screen controls are supported and they work well with the game but even with all its unlockable characters, ten minutes of playing iHUGU is more than enough time to experience all aspects of gameplay, but hours are required if you wish to see the game’s secrets and references. 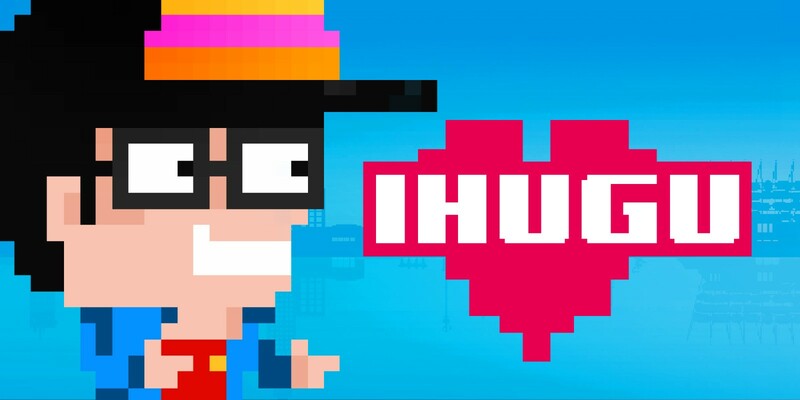 Although iHUGU feels more like a mobile app than an actual game, at $3.99 it is a simple to play arcade game that you can fit into your everyday life, with no inconvenience. It’s not really something you need to play on the TV for hours on end, but it’s certainly a game you can keep coming back to and use to relax for a bit, before getting back to your day to day activities and reality.